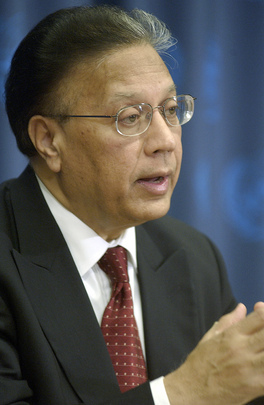 Ambassador Anwarul Chowdhury is former Under-Secretary-General and High Representative of the UN; chairman of the UN’s Administrative and Budgetary Committee in 1997-1998 that approved Kofi Annan’s first reform budget; initiator of the Security Council resolution 1325 underscoring women’s equality of participation; and a well-known analyst of the UN system’s work. NEW YORK, Oct 14 2016 (IPS) - United Nations’ apex forum, the General Assembly elected the next Secretary-General yesterday by acclamation rubber-stamping the recommendation of the Security Council (SC). I am appalled by the choice of 15 members of the Security Council of another man following eight others in 70 plus years of UN’s existence as if only men are destined to lead this global organization. The Council members were totally insensitive to a groundswell of support worldwide for a woman as the next Secretary-General. They advanced the legacy of ignoring the 50 per cent of humanity in their action. This is an absolute aberration of the system whereby the 15 members of the Council impose their choice prompted by P-5 pressure and manipulation upon the total membership of 193, not to speak of wide swath of civil society opinion and activism for a woman Secretary-General. It is so very unfortunate that in the selection process politics has trumped women’s equality, violating UN Charter’s article 8 which underscores the eligibility and equality of men and women to participate in any capacity in all its organs – principal or subsidiary. The grapevine is spreading that one of the East European women candidates would get the post Deputy Secretary-General (D-SG) as a part of the deal about the new SG. This is not a big deal as we already had two woman DS-Gs in the past. It should also be remembered that when the DS-G post was created in 1998 by the General Assembly, it was the understanding that if the S-G is from an industrialized country, the DS-G would be from a developing country and vice-versa. Similarly, if the S-G is a man, the DS-G should be a woman – no possibility of vice-versa till now. This double balance in UN’s two highest posts has been ignored on occasions in recent years. I would also underscore that the new S-G should bring in a true and real 50-50 gender balance at the level of Under Secretaries-General (USGs) and Assistant Secretaries-General (ASGs). This is an action which should be clearly laid down in a transparent way within the first 100 days in office. UN General Assembly’s 70th President Mogen Lykketoft’s praiseworthy initiative for exposure of the candidates to wider membership and civil society did not have any impact of the predominant political process in the Security Council. Doing well in a Q&A is not a shortcut to the world’s most demanding job. I believe strongly that a most practical and feasible way to prevent such Security Council’s choice imposition– though the UN Charter envisages as such– the General Assembly should decide to also hold straw polls on all candidates the way Council does to send a signal about how the majority of UN membership is expressing their choice. This can be done informally like the SC straw polls but made public and transmitted to the Council. This will at least tell the world how the UN membership as a whole is assessing the candidates and hopefully will have an impact on the Council’s choice. All this can be done without amending the Charter or disrespecting any of its provisions. Like any leader of an organization, the UN leader’s success or absence of it depends on his team. That is another area I belief needs a total overhaul in UN. It is long overdue. As in case of any new corporate CEO, each time the UN’s Chief Administrative Officer – that is how the S-G is described in the UN Charter – gets elected or reelected, interested quarters wonder whether he will introduce any new guidelines on senior appointments, and will he be subject to pressure from the big powers — as it happened with his predecessors?. In that context, it is strongly felt that the UN’s so-called political appointments at ASG and USG levels should be more transparent and open. The pressures from Member States and personal favoritism have made the UN Charter objective of “securing the highest standards of efficiency, competence and integrity” (article 101.3) almost impossible to achieve. It is also to be kept in mind that for his (yes, still it is “his”) own appointment, the incoming Secretary-General makes all kinds of deals – political, organizational, personnel and others. And those are to be honored during first years in office. That then spills over for the second occasion when he starts believing that a second term is his right, as we have seen in recent years. The tradition of all senior management staff submitting their resignations is only notional and window-dressing. The new Secretary-General knows full well that there is a good number of such staff who will continue to remain under the new leadership as they are backed strongly by influential governments. In the process, merit and effectiveness suffer. It is a pity that the UN system is full of appointments made under intense political pressure by Member States individually or as a group. Another aspect of this is the practice of identifying some USG posts for P-5 and big contributors to the UN budget. The reality in the Secretariat does not reflect the Charter objectives – I believe it never did. One way to avoid that would be to stop nomination and lobbying – formally or informally – for staff appointments giving the S-G some flexibility to select senior personnel based on “competence and integrity”. Of course, one can point out inadequacies and possible pitfalls of this idea. But, there the leadership of the S-G will determine how he can make effective use of such flexibility being made available to him. No Secretary-General would be willing or be supported by the rest of the UN system to undertake any drastic reform of the recruitment process for both the senior management or at other levels. Also, at the end, he has to face the Member States in the General Assembly to get their nod for his reforms. Yes, opposition will be there, both from within his own Secretariat and from influential Member States, but the determination and effectiveness of leadership of the new S-G will be tested in having the courage to push a drastic overhaul of the appointments and recruitments practice within the UN system as a whole.